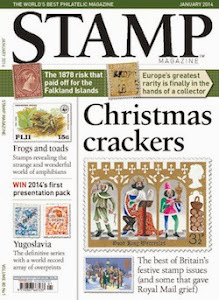 Last month's main feature in Stamp Magazine, on collecting stamps by engraver, has led to a lively discussion on our forum. And so, when one of our eminent engraver collectors suggested focusing on the engravings of Elsa Catelin, a relative newcomer on the French stamp-engraving scene, I needed no further encouragement and went in search of Elsa! 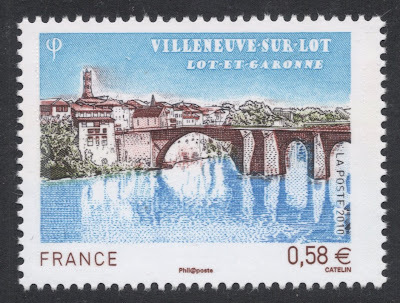 The first stamp I came across was this 2010 stamp, depicting Villeneuve-sur-Lot. A lovely, romantic scene, and the reflection in the water, especially, is rather effective. Makes you wonder what it would be like if Royal Mail would embark on a similar, recess-printed, long-running series of all those beautifully quaint English villages! I was also rather charmed with this 2009 stamp depicting Tarbes. 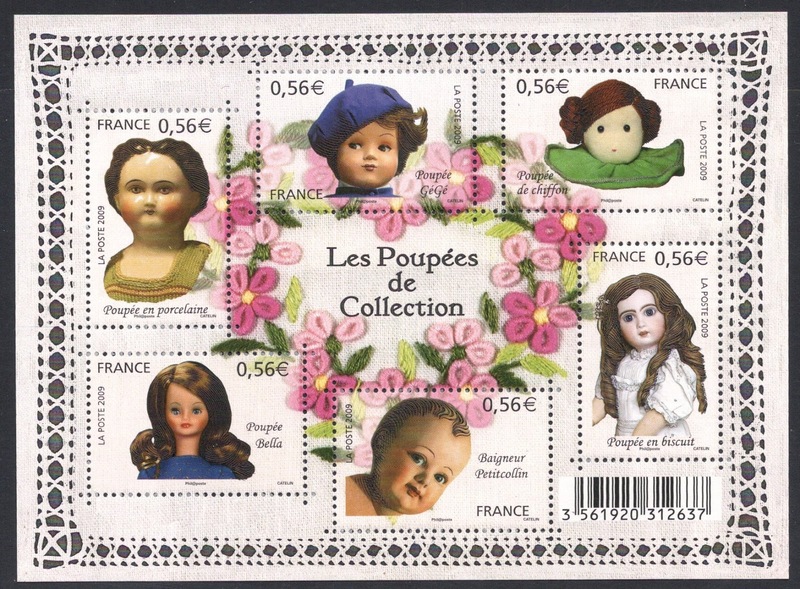 Again a beautiful stamp, but what about that horse on the non-postal label?! If that were a 'proper' stamp, I would immediately vote it my best horse stamp ever. 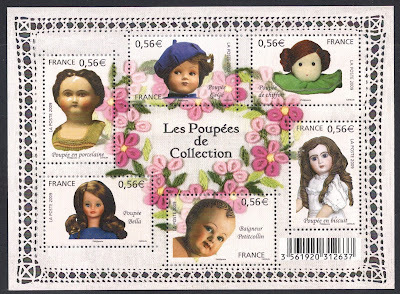 Not my cup of tea, this dolls miniature sheet from 2009, and although bits of it are engraved (mainly the hair) it is basically just a litho-printed stamp sheet. I'll say this for it though: the lace effect on the border, which is also engraved, is rather stunning. 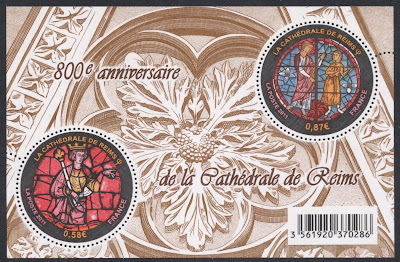 Improving things no end is the next miniature sheet, from 2011, depicting stained glass windows from Reims Cathedral, marking the 800th anniversary of that cathedral. 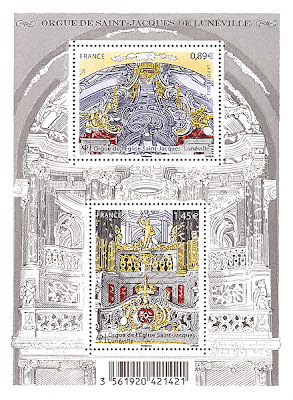 I would say that my favourite Catelin work, so far, is another miniature sheet, issued only late last year, depicting the organ of the church of Saint-Jacques in Lunéville. The stamps are gorgeous, the colours work so well, the background is perfect, too, and even the barcode has been sort of incorporated into the design and doesn't stand out. 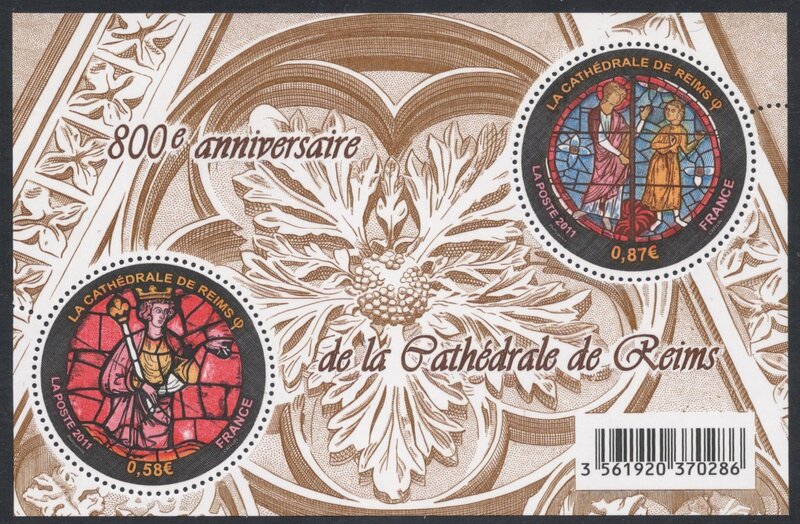 And, of course, again, the whole sheet, both stamps and background, is engraved. A pure feast for the eyes! Want to participate in our ongoing stamp engravers forum thread? Well, then, you're more than welcome. Have a look here! Thanks a Lot-et-Garonne! Good work. >>Makes you wonder what it would be like if Royal Mail would embark on a similar, recess-printed, long-running series of all those beautifully quaint English villages! 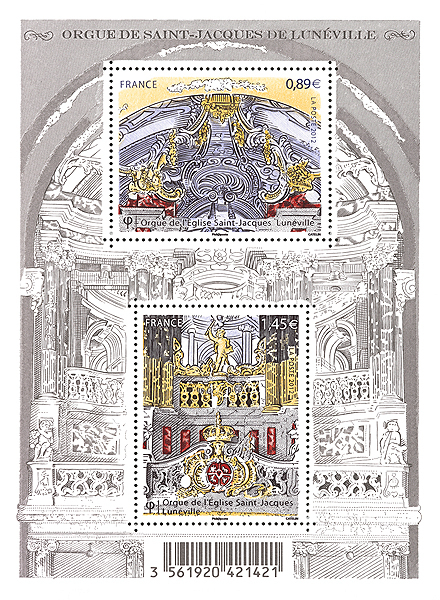 The French miniature sheet picturing the organ is a beauty. I'm going to get one. Elsa will be one of the greatest engravers of all time.